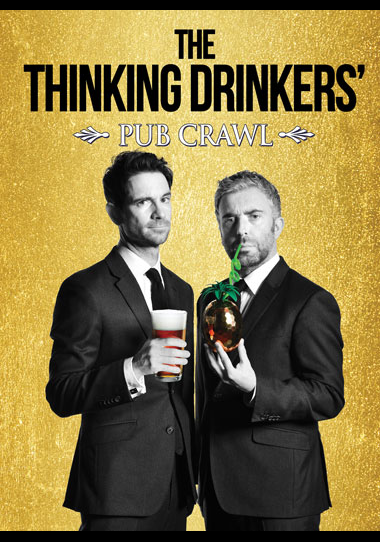 Returning for another UK tour, the Thinking Drinkers are embarking on a bar-hop through history as part of their new show Pub Crawl – an interactive imbibing experience during which every single audience member tastes five fabulous drinks. For free! Beginning with the cerebral wine-sipping symposiums of Ancient Greece via Wild West saloons, Victorian gin palaces and all the way through to the classic Great British pub, the Thinking Drinkers wander through the world’s most wonderful watering holes while furnishing their audience with several samples of seriously delicious drinks. As educational as it is entertaining, the Thinking Drinkers Pub Crawl is a riotous and intoxicating exploration of history’s greatest drinking establishments – an especially pertinent celebration given the fact that 18 pubs are closing every week.